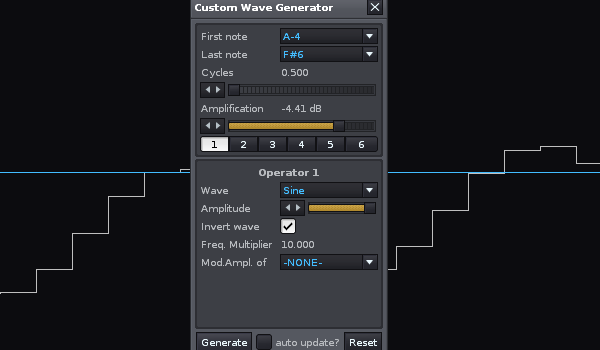 The special oscillator type "Wave" allows to use a sample of the song as an oscillator, similarly to a wavetable oscillator. Hint: You can rapidly test multiple takes of the resluting samples while keeping the tool window opened by clicking outside the window tool, which is not modal, and use the PC or MIDI keyboard in order to play the created sample. The "Auto generate" button will automatically refresh sample data upon parameters changes.